Tom and I have settled into life in London now and have a good rhythm between work and rest – time to get back on the cycling side of things! Time to find a club to join for those longer rides and also so that I can learn all the local roads! Up until now all I’ve known is my commute in the city and the way to Richmond Park. There are loads of different clubs in and around London – I chose Dulwich Paragon as they are my ‘local’ club and meet just down the hill at Herne Hill Velodrome. Every first Saturday of the month the club invite prospective members to come out on the Saturday club ride – I wasn’t going to be around until the first Saturday of October so I jumped straight in and joined up. Factoid: Dulwich Paragon has been around since 1935 and currently has 610 members, of which 54 are women. 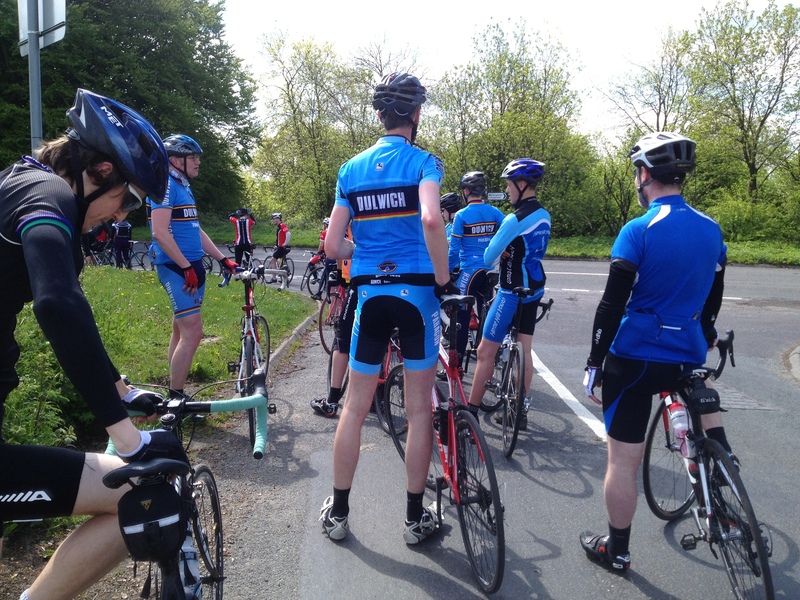 I’ve been out on a couple of Saturday rides with Dulwich Paragon so far – here we are waiting at a junction for the slower ones to catch up before riding on. Now that I know a few more roads and routes around Kent and Surrey I’ve been going out on solo rides (Tom has been busy racing all over the country so I’m often alone at the weekends).